"THE CITY SEEN FROM THE QUEENSBORO BRIDGE IS ALWAYS THE CITY SEEN FOR THE FIRST TIME, IN ITS FIRST WILD PROMISE OF ALL THE MYSTERY AND BEAUTY IN THE WORLD." a full-service experience that breaks the mold of what is typically expected of a real estate experience. Having cultivated strategic partnerships along the way, we strive to provide our customers with legendary service. James is an international real estate broker with specialized expertise in the design, marketing, and sales of luxury residences and hotels. His experiences have led him to develop priceless insight into the luxury lifestyle and development world. 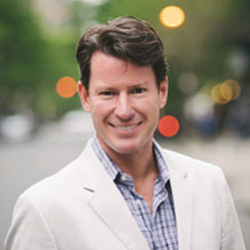 Prior to shifting to development and real estate, James was involved in the business and management side for twelve years as Director of Residences for Ritz-Carlton based in New York City. James also served as Director of Residential Development, Sales and Marketing Worldwide, for Capital Partners where he led sales teams across the world and generated more than $200 million in annual sales. His extensive portfolio of landmark development projects include the J.W. Marriott Hotel and Residences, Almaty and Ritz-Carlton Hotels and Residences in Moscow, Astana, and Almaty. James attributes his success to his commitment to excellent service. His tenacity and straight-forward, honest demeanor are respected by clients and colleagues alike. A native of upstate New York, Frank moved to Manhattan to pursue a degree in Entrepreneurial Studies at Pace University. Upon graduation, he secured a position as a real estate executive assistant with Town Residential. While there, Frank interfaced with clients and colleagues to deliver excellent customer service, and contributed to the early growth of the company. Frank also helped to establish quality control standards at the firm. 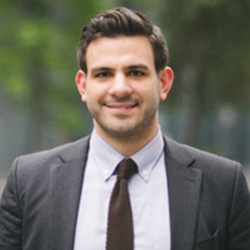 As a licensed real estate salesperson, Frank worked in conjunction with several top producers to acquire new development experience on projects such as 1 York Street, 70 Greene Street, and 88 Franklin Street. As an integral part of the James Cox team, Frank’s focus is to continue to expand their international luxury property portfolio, while maintaining the highest standards of customer service for his clientele. 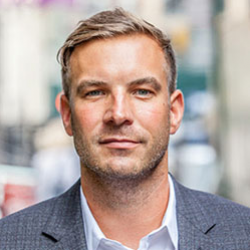 With eight years of personal experience buying, selling, and renovating homes throughout New York City, Chad understands firsthand how personal and emotional real estate can be. With a keen eye for investment properties and vision for renovation, Chad has been a part of numerous transactions that have yielded high returns. He bought, renovated and sold a 2-bedroom co-op in Greenwich Village at a 60% return, setting a record for the building. Most recently, he sold his half-brownstone co-op in Brooklyn Heights for 17% over the asking price in less than 2 weeks. As an owner of a condo in Prospect Heights as well, he has successfully rented the property for market rates for the past 3 years. It was his personal success with properties and investment intuition that led him to turn his passion into a career. Prior to joining Compass, Chad honed his business development skills and passion for building relationships working in the digital marketing space with clients like Puma, Tommy Hilfiger, Target and The North Face. Whether on the agency or brand side, he played an integral role in implementing strategies that resulted in driving sales. It is this marketing expertise and client-focused, results-oriented strategy that he brings to Compass. A native of Portland, Oregon, Chad has always had a keen business sense and an eye for design. He studied photography at the Brooks Institute in Santa Barbara, California before moving to the East Coast almost a decade ago. He and his wife live in a loft in Tribeca, which they share with their dog, Mabel. When not working, Chad spends his time road biking and running in East Hampton. The partnership of James C. Cox Jr., Frank Giordano, AND CHAD MALTBY at Compass, provides clients with a full-service experience for buying, selling and managing real estate investments in New York. Recognized among the top 75 teams in New York by The Real Deal, James C. Cox Jr., Frank Giordano and Chad Maltby and consistently deliver the best possible results for their buyers, sellers, tenants and landlords. Combining a global perspective with unparalleled knowledge of the New York market, the team is uniquely suited to guide clients through the world of high-end NYC real estate. Building off of their accomplished backgrounds in the hospitality industry, they offer a creative approach to negotiating and marketing that proves invaluable to their clients, whether first-time buyers or international investors.